Premier Pro Series Tenor Drums have revolutionised the sound of today's Pipe Band. In a short period of Pipe Band history the sound of the mid-section has changed to become a warmer, richer sound with controlled decay. 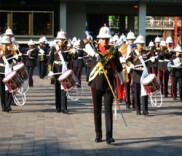 The drums have become the choice of a number of the top competition bands in the world. The standard of good drum sound has changed forever and Pro Series has led the way. Silver Powder Coat (SPC) fittings standard, White (WPC) and Black Powder Coat (BPC) available. Premier Pro Series Bass Drums have revolutionised the sound of today's Pipe Band. The standard of good drum sound has changed forever and Premier has led the way.